In surgery, millimeters are everything. When replacing a knee or a hip, a difference that’s barely visible to the naked eye can affect the success of a replacement. But the new MAKOplasty procedure allows doctors to be more precise than ever in these operations. MAKO uses a highly advanced robotic system that enables surgeons to make ultra-precise alignment and placement of implants for both partial knee and total hip replacement procedures. It’s also less invasive than traditional surgery, thanks to the Robotic Arm Interactive Orthopedic System (RIO). Through RIO, doctors get CT scans of a patient’s knee or hip to provide a roadmap for the surgery. 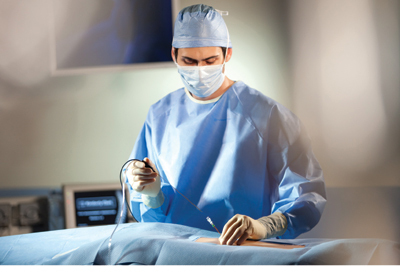 Computer-guided mapping software (similar to GPS) is integrated into the surgical instruments to ensure exactness within .2 mm accuracy. Replacements can be tailored to an individual’s bone/joint makeup. This level of precision is crucial for patients. “A few degrees of malalignment this way or that way…can lead to increased pain for the patient and increased stress on the implant,” says Dr. Scott Yerger, orthopedic surgeon at Lafayette General Medical Center, the first hospital in Acadiana to use MAKOplasty. Because it’s minimally invasive, MAKOplasty allow for shorter hospital stays, more rapid recovery, less scarring, and reduced pain. It’s recommended for adults suffering from early to mid-stage osteoarthritis. Dr. Yerger says more patients are experiencing osteoarthritis at younger ages, and the new technology can help young people receive partial knee replacements to restore mobility at earlier ages. In the past, most patients were encouraged to wait until at least their 50s or 60s before undergoing the procedure. Now, younger patients can avoid the years of pain that postponing the replacement caused. For total hip replacements, the improved precision of MAKOplasty provides for more accurate cup placement and leg length restoration. As a result, patients are much less likely to suffer from a hip dislocation. “This is the most exciting development in orthopedic surgery in the last 25 years,” says Dr. Yerger. While it’s common knowledge that smoking causes lung cancer, many people are unaware that by the time its symptoms appear, it’s often too late. The key to beating it is to detect it before a patient becomes symptomatic. For Central Louisiana residents, Rapides Regional Medical Center has taken a big step forward with lung cancer prevention with the September introduction of its “Rapides Lung Check,” a low-dose CT lung screening. The screening is recommended for people ages 55-74 who have smoked at least an average of a pack a day for 30 years, even if that person has already quit smoking. It’s also recommended for people ages 50w-74 who have averaged at least a pack a day for 20 years and have one other risk factor (e.g. previous cancer, emphysema, pulmonary fibrosis, family history of lung cancer). For these high-risk patients, the painless and non-invasive test lowers the risk of death from lung cancer by 20 percent. The radiation dosage is low and on par with the amount a woman receives during a mammogram, according to Karen Hathorn, director of oncology at Rapides Regional Medical Center. The exam takes less than 10 seconds. No needles or medication are needed. Patients are able to eat before and after. The only restriction is they can’t have clothing containing metal on their chest. A physician must give an order for a patient to receive a test. “Before sending someone for this test, I would take a look at their family history, their risk factors for lung cancer, their current medical condition, and their smoking habits,” says Dr. Greg Ardoin, a pulmonologist at Rapides Regional Medical Center. Hathorn says the test is important because no matter how much hospitals preach no-smoking, people still do it. Her hope is that by detecting cancer early, it will save lives and give longtime smokers the wakeup call they need to finally quit. No two human beings are identical. The same is true of tumors. Some malignancies respond to treatment in the form of chemo, radiation, and surgery. Others go away briefly, only to return with a vengeance within two years. The challenge is twofold: finding a treatment that will eliminate the cancer and not putting patients through the rigors of chemo or radiation if that person is predisposed to reject the treatment. At University Health System in Shreveport, exciting strides are being made in personalizing cancer treatment based on each patient’s genomic profile. Dr. Cherie-Ann Nathan, chairman of the department of otolaryngology at LSU School of Medicine, says many head and neck tumors do not present symptoms until they are in advanced stages. Typically, surgery plus chemo and/or radiation is required. After the initial surgery, patients must go through additional procedures to reconstruct the area ravaged by the disease. For a patient to go through all of this only to have a recurrence is heartbreaking. But now, Dr. Nathan says it’s possible to determine what treatments are most effective for an individual tumor. After biopsy, doctors can magnify the DNA to see which specific mutations are present, which can give them a better sense of whether or not chemo will work. The ERCC1 expression is a common one that does not respond to cisplatin, a popular chemo drug, or radiation. Unsuccessful chemotherapy is particularly common in patients with a recurrence. According to Dr. Nathan, only 10% of patients with head and neck tumors respond to chemo after a recurrence, but a whopping 90% of them receive it anyway. This costs patients unnecessary pain and needless expense to hospitals and insurance providers. Genomic profiling is gaining traction throughout the medical community. The American Thyroid Association is further recognizing it as a valid treatment in its next guide. “It’s an exciting time to be in cancer treatment,” says Dr. Nathan. Chronic joint pain can be a depressing and debilitating experience for those who suffer from it. In the past, patients could get short-term relief from outlets like cortisone injections, oral anti-inflammatory medications, and physical therapy. At Ochsner Baptist Hospital in New Orleans, doctors are now using the COOLIEF Cooled Radiofrequency (RF) treatment to provide long-term relief for people battling daily back, hip, or knee pain. “Cooled RF allows us to treat areas of the body we couldn’t treat before with ablation,” says Joseph Savoie, clinic manager for pain management at Ochsner Baptist. The treatment uses cooled RF energy to target the sensory nerves with RF energy and cooling via water circulation through the device. This results in a larger treatment area than previous RF options, allowing it to treat new areas of the body. Ochsner Baptist is the first hospital in the Greater New Orleans Area to use the procedure, which is minimally invasive and done on an outpatient basis. While the old methods of pain relief would last for six to twelve months at best, COOLIEF can reduce or eliminate pain for nine to 24 months. Most patients experience improved mobility and can return to normal activities within a few weeks. For men suffering from very enlarged prostates, Ochsner Medical Center in Baton Rouge has introduced a new procedure that can solve the problem without the hassles of the traditional prostatectomy. The robotic-assisted simple prostatectomy is a procedure where the interior of the prostate is removed laparoscopically so it’s no longer blocking the flow of urine. The doctor makes five small incisions in the lower abdomen. Advanced optics provide magnified 3D images of the prostate and surrounding nerves. The procedure is recommended for men with very large prostates (100-400g). For smaller ones, the traditional method of entering through the urethra is still required. With the robotic-assisted prostatectomy, patients go home the next day, lose less blood, and are back to normal activity in 1-2 weeks. This is an improvement over the standard procedure, which typically necessitates a 2-3 day stay in the hospital and a liter of blood loss. Dr. Dudley Atkinson, a urologist at Ochsner in Baton Rouge, says this new innovation can make life significantly easier for affected men. Many have to wake up 3-4 times in the middle of the night to urinate and with a very weak stream. After the procedure, they may only wake up once in the night and will experience a normal urine flow again. William Senn, age 73, had the procedure done and spoke positively about the experience. Dr. Atkinson, the only physician in Baton Rouge offering the robotic-assisted simple prostatectomy, says many candidates for the procedure are unaware that it even exists. “It’s something I wish could do for more people because it really helps them,” says Dr. Atkinson.